Add some sparkle & love to bath-time with DOY Kids Princess Soap! She' ll kiss away the dirt & grime, leaving only clean skin behind. With its unique formulation, DOY Kids Soap aims to protect your child's sensitive skin with the infusion of Natural Milk Cream and Shea Butter, which will keep your child's skin soft, supple and well moisturized. Doy soaps cleanse skin effectively. They work up a luxurious rich lather, hydrate the skin and lock in moisture, leaving your little one with soft, supple and nourished skin all year round. Now available in fun animal shapes and characters and fresh fragrances, DOY Soaps will leave your kids skin dirt-free and fresh all day long. Additional Information: Manufactured and marketed by VVF which is an Indian multinational organisation, well established in the Personal Care industry, DOY mission is to help you discover and connect with your natural selves, thereby unlocking your real beauty.Doy knows that what goes on your body is as important as what goes in your body, and that' s why they have created a range of products that offer the experience and benefits of pure, natural ingredients which help nurture and nourish your natural beauty. Explore the entire range of Soaps available on Nykaa. 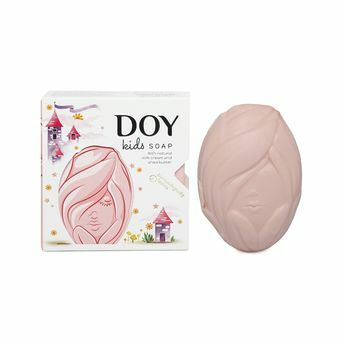 Shop more Doy products here.You can browse through the complete world of Doy Soaps .